Standard Binding Agent is a Blood Magic Alchemy reagent. It is used to adding effect for Potion Flasks. Several effects can be added for one potion, but the more effects a potion has the less chance of success. And in case of failure, the potion will explode. 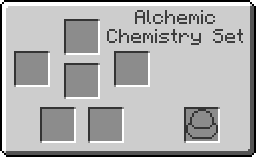 Chances of success are calculated by the formulas: 0,65^X, where X is the number of potion effects before adding a new one. Blaze Powder add effect Strength I (2:00). This page was last modified on 14 December 2018, at 06:52.